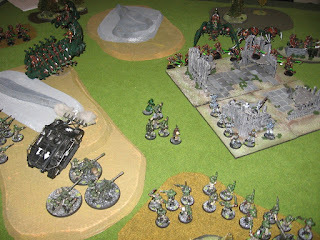 Second game in a week, our response to the frustration of having to spend a lot of playing time wading through the 4th edition 40K rules book trying to find the right section/rule (partly a comment on the rules book/indexing system .. or lack of .. and also on the infrequency with which we play this rules system). Again Necrons versus Guard, the mission to hold the central objective - the ruined temple in the centre of the table. 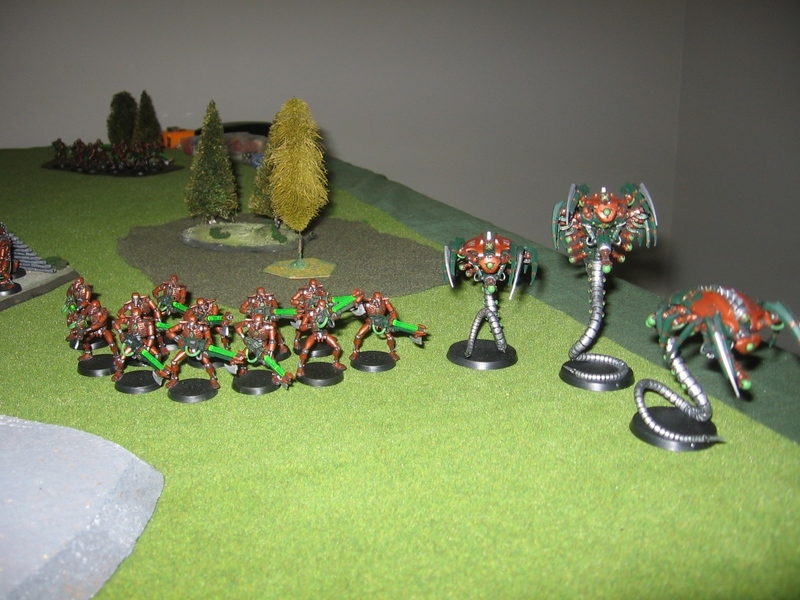 Guard deployed on the left of the photo, Necrons on the right. 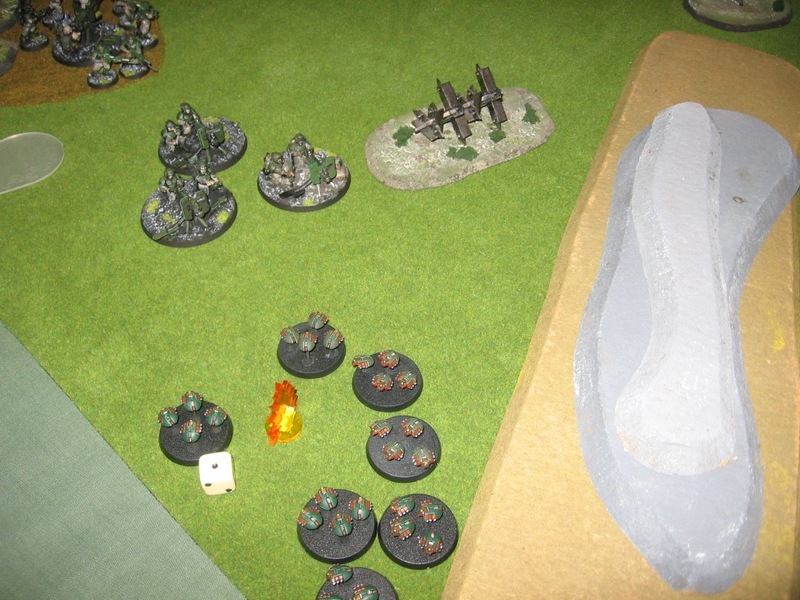 Adrian chose to deploy his Monolith at the outset of the game rather than have it come in from reserve. I gained first turn. 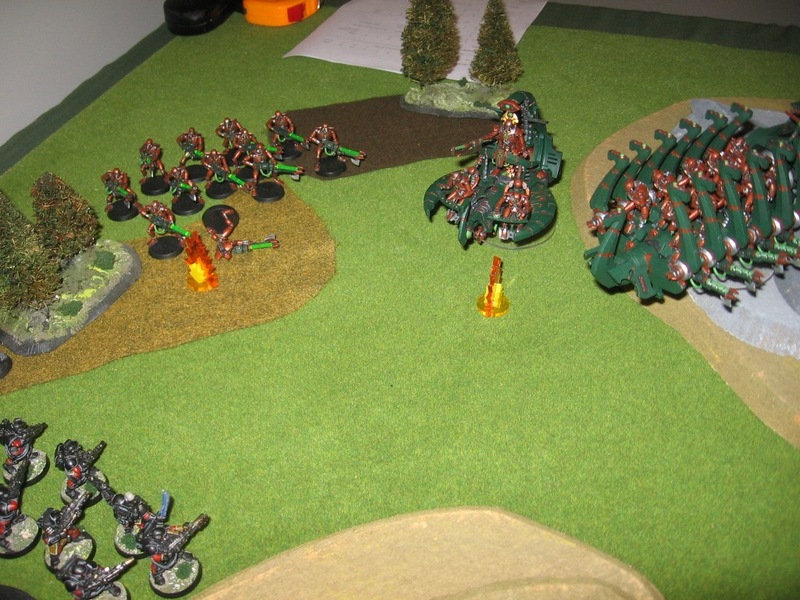 Fore was also directed at the advancing Necron warriors from a squad of autocannon supporting the Guard centre. 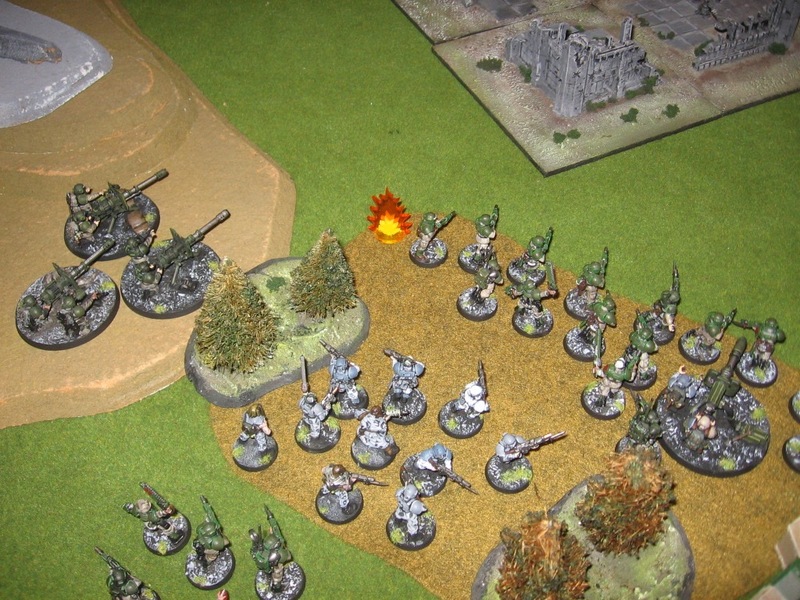 My plan was to stack the left and centre, with a strong merged squad held back from the temple in the woods to provide cover, but within 12" of the objective. 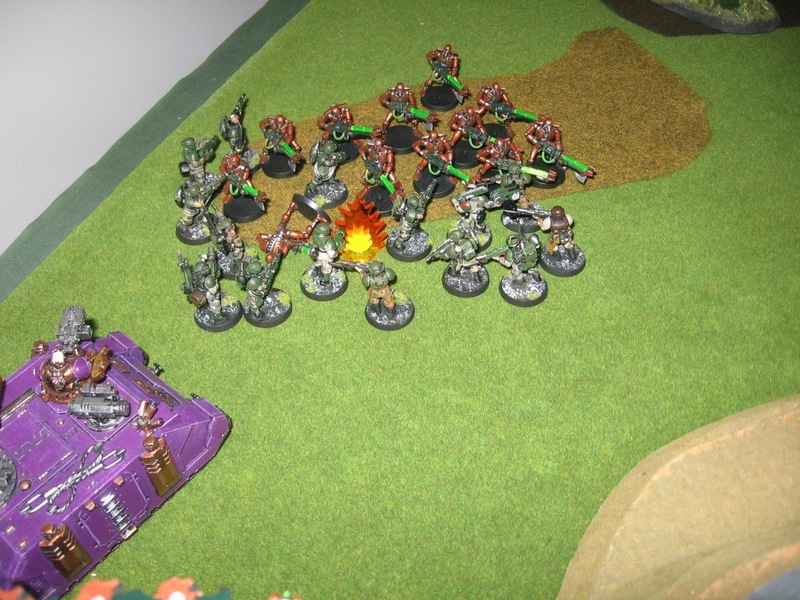 As the Guard is know for its firepower I wanted to allow Adrian to take the centre, and soak his troops in fire from Guardsmen, autocannon, Heavy Bolters, and a lascannon. 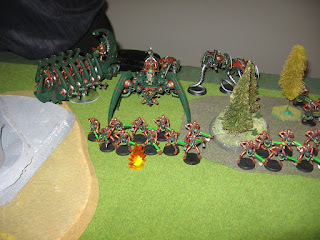 I had taken a special weapons squad equipped with flamers, mounted in a chimera, ready to assault the Necrons who I expected to take the temple. I held several squads in reserve, and had a unit of stormtroopers mounted in a Vendetta gunship. 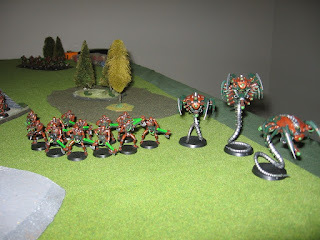 I expected to drop them in amongst the Necrons to assault them. 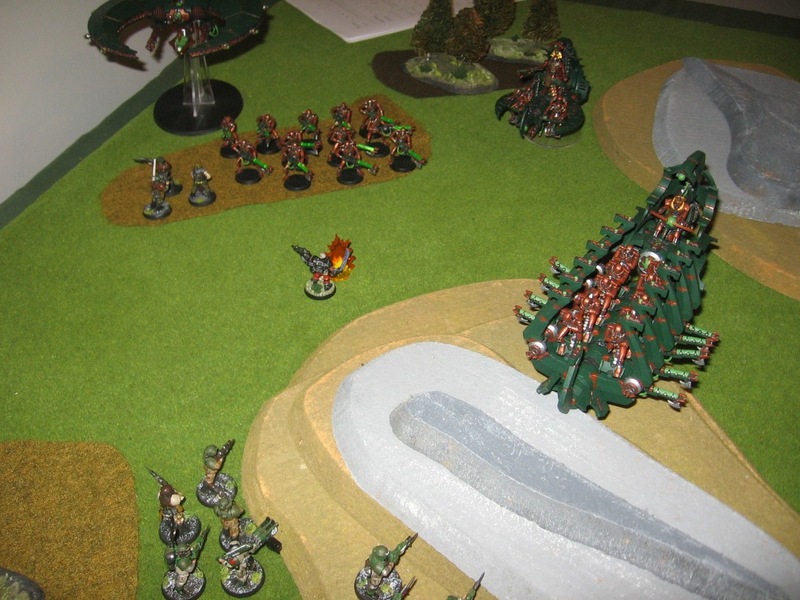 The left flank was stacked to allow me to apply pressure on the flank of the advancing Necrons. 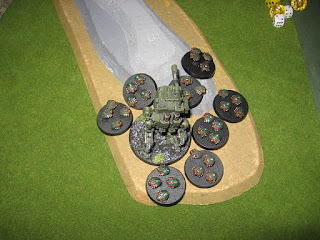 I used two Rhinos to proxy for chimera apc's. 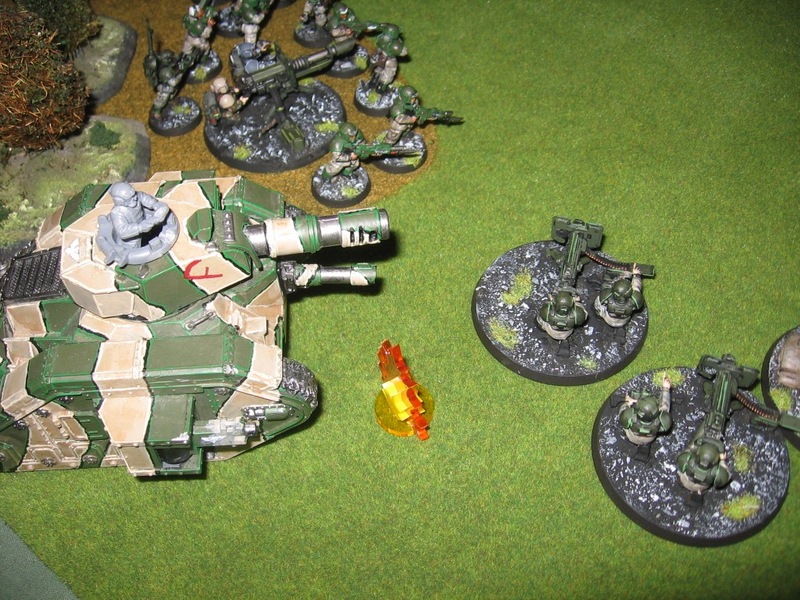 The left most rhino held a veteran squad with three grenade launchers to provide some left flank firepower. 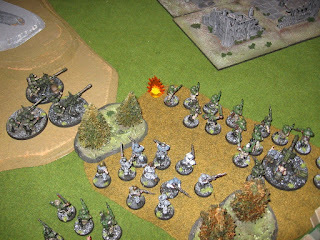 The central merged squad in cover, taking fire. 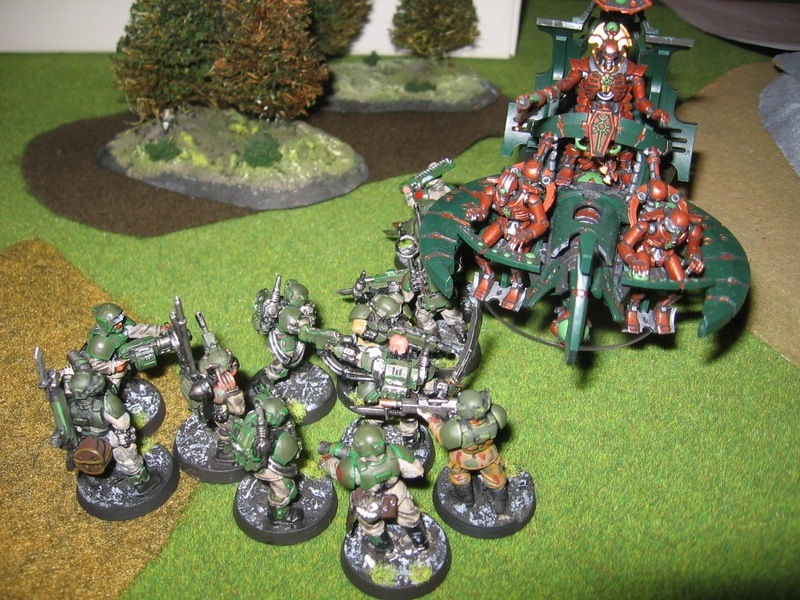 The autocannon squad supporting them is on their left. 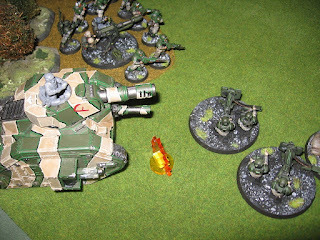 The Vendetta arrived, dropped the stormtroopers and tried to take out the Necron barge .. nope missed that too, even with three twin linked lascannon. A chimera advances, pops smoke, and discharges the special weapons squad, flamers at the ready. The temple ruins are now occupied by two squads of Necron warriors, and a unit of Wraiths. They attract a lot of fire as per the plan and .. nope .. no effect. I push the veteran squad forward. They bring a lot of G/L fire on the Necrons and fail to hit. They then assault, accompanied by the Company command squad. The Special weapons squad advances into the temple ruins and swathes the Necron warriors with prometheum. Manny Necron warriors fall, .. and promptly get back up again.. sigh!!! 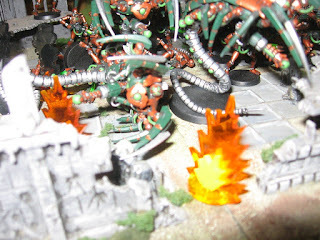 It's hell in there, but the Necrons are ... machines.. they don't care. 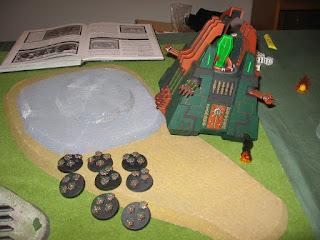 While the Leman Russ destroys the Necron flyer. The veteran squad, lead by the company commander (armed with a power fist) assault the Necron barge. 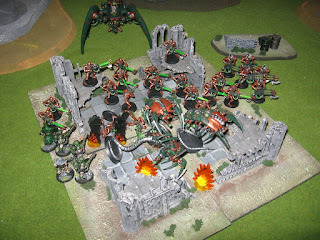 There are Krak grenades flying in all directions. 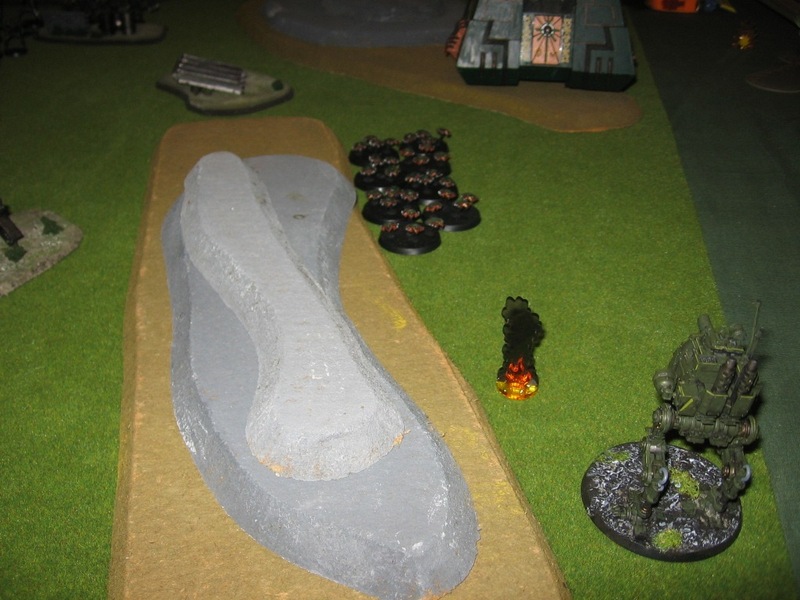 The Barge loses its armament but is still there. The position is now pretty hopeless for the Guard, and the withdrawal begins. 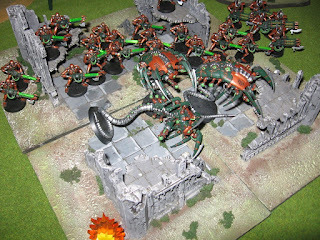 Can the Imperium ever halt the Necron advance? Probably not while I'm in command. 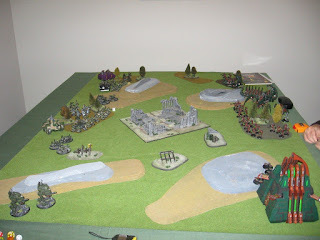 I'd modified my Guard list from the last game.. well more of a simplification really. I took almost all of the heavy weapons out of the squads to make them more mobile/flexible. 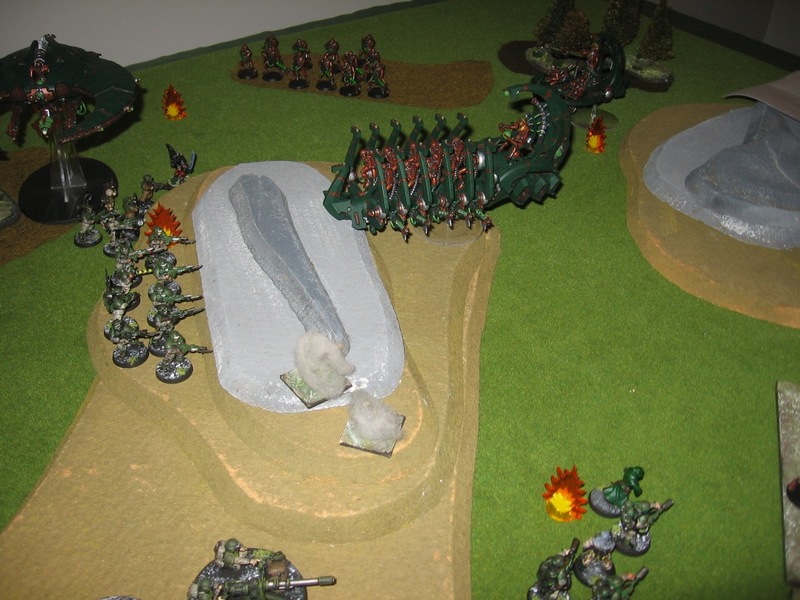 I added in a special weapons squad, and mounted it and the Veterans in chimeras. More mobile, but I failed to exploit that mobility. 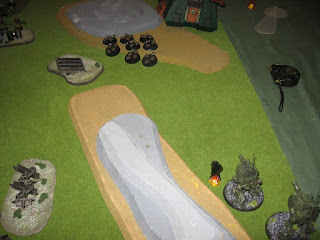 I think the force is more flexible and easier to use, but the plan didn't work. 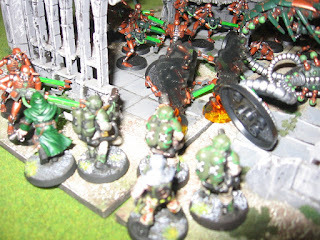 I over-estimated the ability of the Guard shooting to take down the Necrons. Have to keep on trying though. 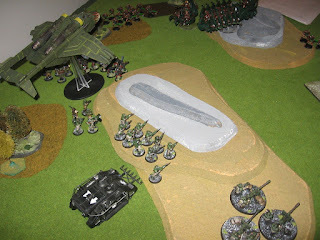 The Imperium is in danger .. The Necron incursion had begun. 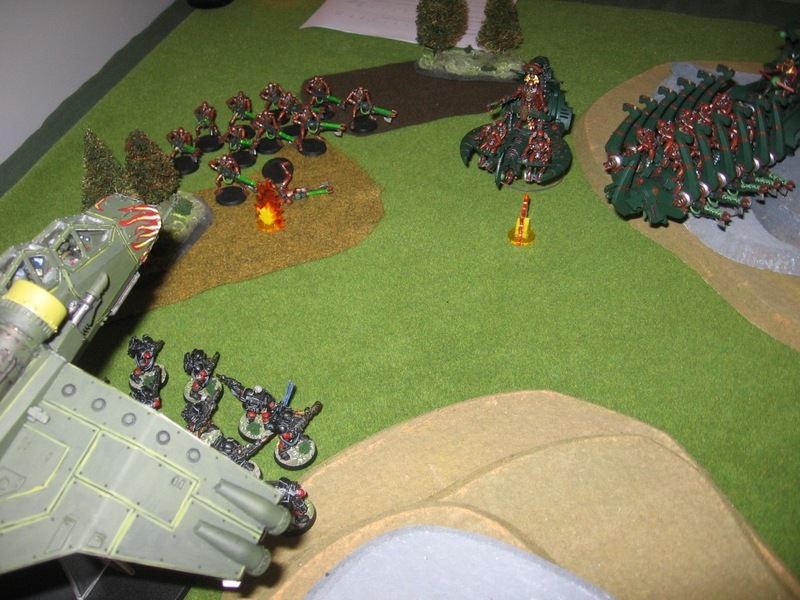 The Imperium had pulled troops from sectors across the galaxy as it marshalled its forces to halt the threat. The very future of mankind was at stake. Adrian and I like to get those lovely 40K troops out from time to time and push them around the table top in games that usually involve lots of laughs, lots of grumbling about the rules system and. . oh yes .. beer. 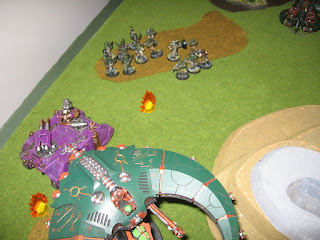 I've commented before that we both became heartily sick and tired of the constant rules/codex updates (we do understand that it is a valid business strategy, we have simply opted not to buy into it figuratively or literally). 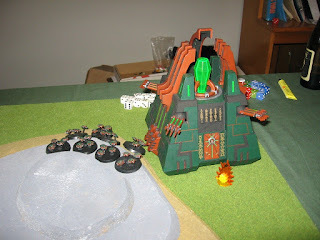 So some time ago we opted to 'freeze' our 40K games in the 4th edition paradigm. It requires one of two tweaks, but as we never game in the tournament scene it really doesn't matter. 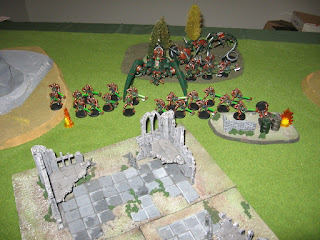 So last night's game was a 'Cleanse' mission played with 1500 points of Imperial Guard (me) versus 1500 points of Necrons (Adrian). The mission has each side set up in diagonally opposite table quarters, with control of table quarters being the underlying objective. Guard front left, Necrons right rear. 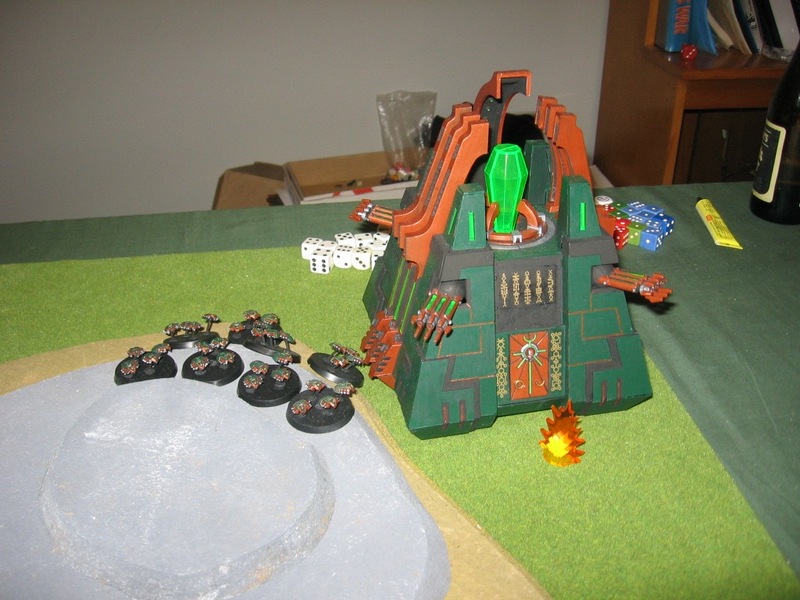 The Necron Ark pushed out to take the sector on the Guard left wing. The IG right has pushed forward with a veteran squad in a Chimera (a battered Rhino re-purposed for IG use), supported by a unit of Sentinels armed with lascannon. 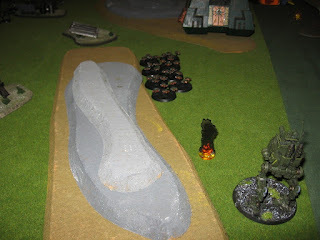 The Sentinels come under fire from the Necorn flyer that has arrived suffering some damage. 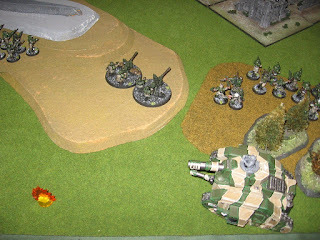 The Guard take more casualties in their centre but hold fast, supported by the Leman Russ. The game ended with a Necron victory as they held two table quarters to the IG one. 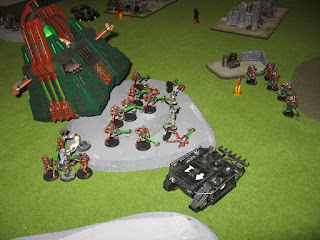 It had been a lot of fun, but took quite a while as we haven't played 40K often enough to get past the constant referrals to the rule book trying to find vague references tucked away in illogical places in the rule book (well, that's how it has seemed to us anyway). For me, a simpler IG army list is in the offing (as I often forget the special little bits/capabilities that some units bring). 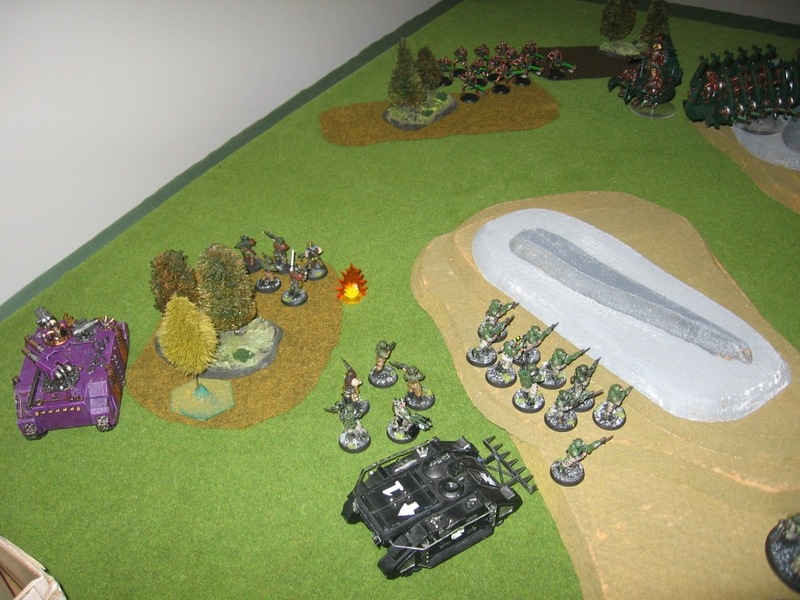 The army as fielded used just about everything I have, but there is the capacity to improve things. 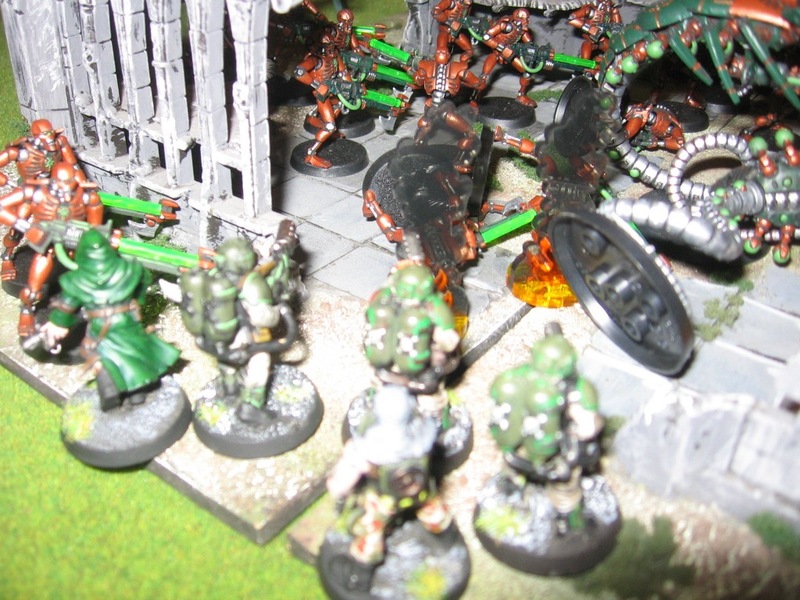 Taking Heavy Weapons out of the squads and using heavy weapons squads will give greater mobility to the infantry squads without compromising firepower. I am also going to trial a special weapons squad mounted in a Chimera. We have another game scheduled soon... stay watching.